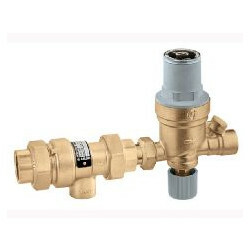 AUTOFILL COMBO FILL VALVE AND BACKFLOW PREVENTER 1/2"NPT X 1/2"NPT - NuComfort Supply Inc.
Pre-adjustable automatic filling valve with backflow preventer. Brass body. Max. inlet pressure: 175 psi. Max. working temperature: 150°F. Setting pressure range: 3?60 psi. Preset outlet pressure: 15 psi.